Texas Rangers second baseman Ian Kinsler has been cleared to start a rehab assignment with Double-A Frisco on Thursday. After getting the clearance to play from team physician Dr. Keith Meister following a full batting practice and fielding session on Wednesday, Kinsler will DH in his first game for Frisco, followed by games on Friday and Saturday at second base. Barring any setbacks, Kinsler is slated to rejoin the Rangers on either Sunday or Monday in time for a four-game series against the Oakland Athletics. Kinsler was placed on the 15-day DL in mid-May after injuring his intercostal muscles (muscles that run between the ribs), allowing top prospect Jurickson Profar to receive his big league call-up. 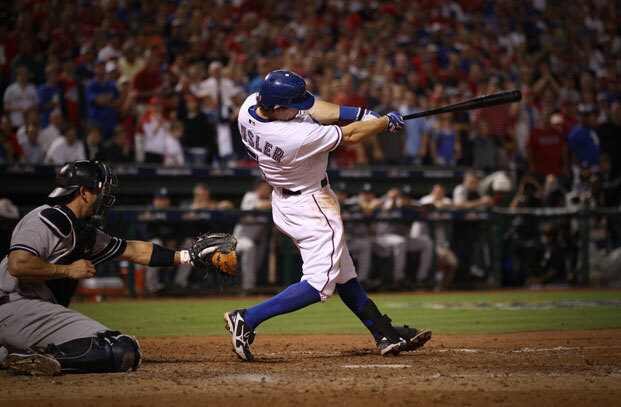 Before his injury, Kinsler was one of the most productive members of the Texas lineup, having batted .302 while slugging seven home runs and driving in 20 runs in 40 games. Ever the fierce competitor and team player, Kinsler should be “ready to help” a Rangers team that has lost six of their last ten games, including their lead in the AL West standings, where they currently sit one game back of the Oakland Athletics.